Corned beef & cabbage is a favorite meal of ours (as it is for most Americans of Irish descent) and a tradition in our house on St. Patrick’s Day. I’ve found that it’s surprisingly easy to brine my own homemade brisket too (here’s how I do it). 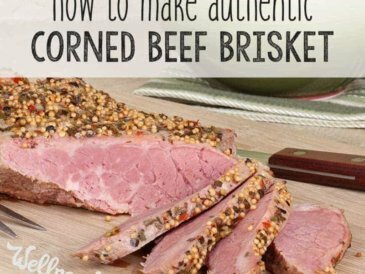 Brining your own corned beef makes this a much healthier dish by avoiding all of the artificial additives found in store-bought, pre-made corned beef. Really, with these modifications, I see no reason corned beef and cabbage can’t be enjoyed any time of year! 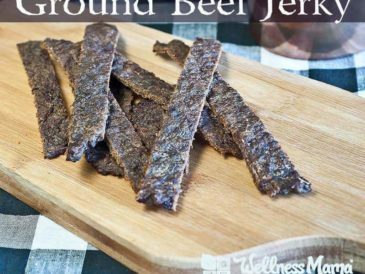 Brining your own homemade brisket may sound like an extra step, but it’s worth it to avoid the added nitrites and chemicals of store bought corned beef. It does mean planning (well) ahead of time, but once you have the corned beef, the actual dish takes virtually no time to put together! Once the brisket is brined and ready, the remaining prep is a snap. I use a Crock-Pot to slow cook the meat but saute the veggies separately in a pan about half an hour before the meat is done for a great texture. Hey … Where’s the Potatoes? 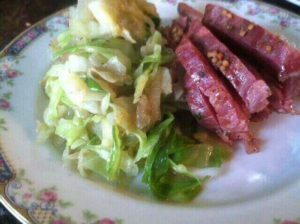 Of course traditional corned beef is not complete without cabbage (which I definitely include lots of) and potatoes. Our family typically avoids white potatoes (here’s why) because they’re starchy and high on the glycemic index, but on special occasions we will indulge in them. 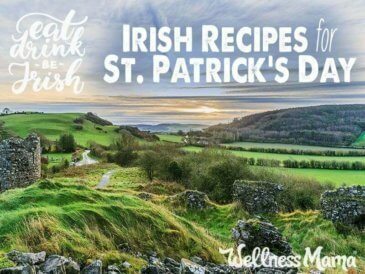 I definitely favor more nutrient-dense options like sweet potatoes or cauliflower “mashed potatoes” on the side instead, but feel free to add a few potatoes to the Crock-Pot in honor of the Irish if you wish! 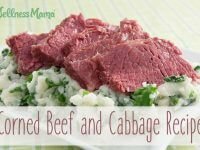 Crock-Pot and Instant Pot versions of this traditional Irish meal that uses corned beef brined at home! First, drain brine, rinse brisket under cool water, and put in Crock-Pot. Turn the Crock-Pot on low and cook for 8 hours. About half an hour before beef is done, chop cabbage, onion, garlic, and carrots. Saute onions, garlic, and carrots in butter or ghee in large skillet until somewhat soft. Add cabbage and spices and cook until soft. Add a little corned beef water from the crockpot if it starts to get dry. 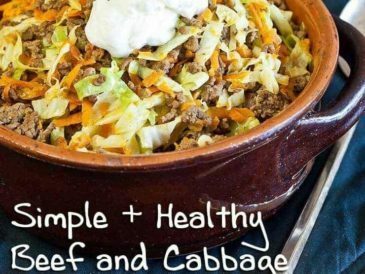 Serve the corned beef over the cabbage and veggies. First, drain brine, rinse brisket under cool water, and put in the Instant Pot. Put the lid on the pot and cook at high pressure for 80 minutes with a 20 minute natural pressure release. While the meat is cooking, chop the vegetables into large pieces. When the 20 minutes is up, release the remaining pressure and remove the meat, keeping it covered to keep warm. Add the vegetables and the remaining ingredients listed for the sides, omitting the butter, and cook at high pressure for 3-4 minutes, releasing the pressure manually when done. You can also cook the vegetables in a skillet with butter instead as detailed above in the Crock-Pot method. 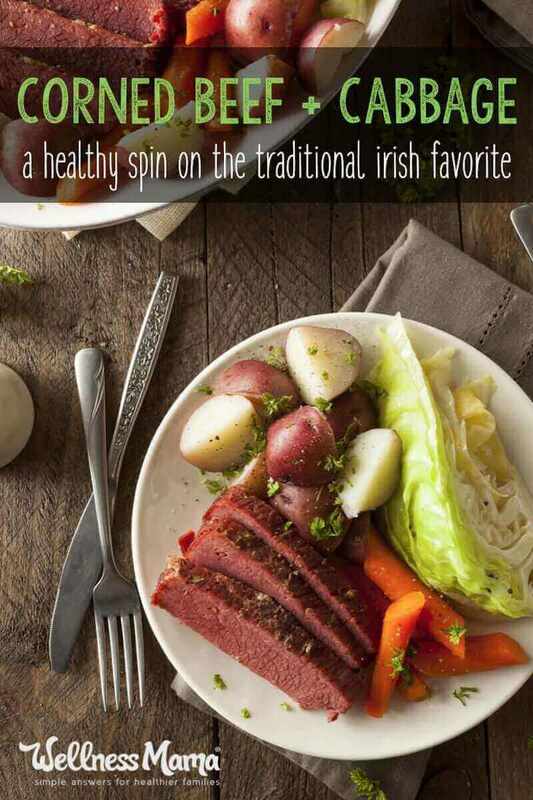 Serve the corned beef over the veggies and enjoy! Serve with cauliflower "mashed potatoes"! Ever made your own corned beef and cabbage before? What are your tips and tricks?